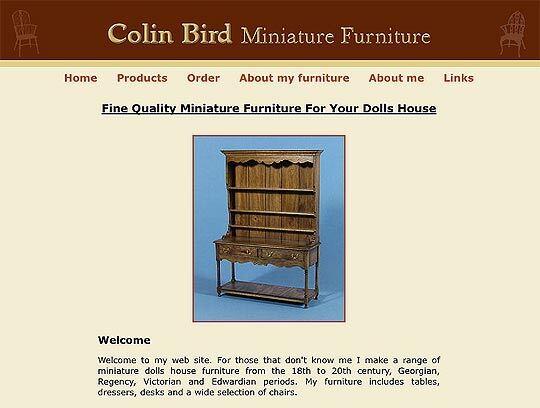 Here is a interesting woodworking site Colin Bird's Miniature Furniture. Colin Bird makes makes a range of miniature dolls house furniture from the 18th to 20th century, Georgian, Regency, Victorian and Edwardian periods. His furniture includes tables, dressers, desks and a wide selection of chairs. The level of detail and skill involved is amazing. If you have ever tried miniature woodworking you will know how difficult it is, your joints need to be 12X more accurate, you finishing needs to be flawless. For his finish Colin uses several coats of very thin coats of shellac cut back with wire wool and finnished with wax. Also making you models look like full sized furniture is difficult due to wood grain. Over sized grain will ruin the effect of scale. To get round this problem this Colin uses closer grained woods like cherry and pear, and yew for the turnnings, which when scalled to 1/12 size with the right stains can look like walnut or oak. All Colins turnings for his chairs is done on a Unimat 3 model making lathe. In 1993 Colin won a gold medal at the National Woodworker Show.